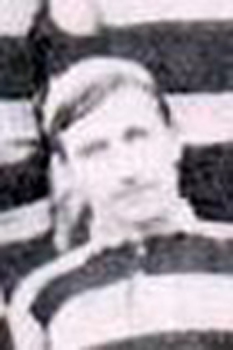 John "Jack" Elliot was a scrum-half who played for Cardiff during the latter years of the 19th century. Although born in the North East (South Shields) Elliott was living in Cardiff by the time he was a young man. Elliot worked in the Mount Stuart Dry Dock in the city (where he became a director) and was also a property owner. His rugby career began playing for Llandaff, before switching to Cardiff in 1892. The first time he was selected to represent Wales was when he was brought in at centre to replace the captain, Arthur 'Monkey' Gould in the final game of the 1894 Home Nations Championships (he made two further appearances for Wales). Jack Elliot was made captain of Cardiff for the 1896 - 97 season and four years after his previous international cap was called back into the Welsh team for the 1898 Championship this time at his preferred position of scrum half. After retiring from playing rugby Elliott continued his connection with the sport by becoming a first class referee. He was also a keen golfer and in 1935 was captain of the Royal Porthcawl Golf Club. He died in Cardiff on 30th March 1938 at the age of 66.